This image combining orbital imagery with 3-D modeling shows flows that appear in spring and summer on a slope inside Mars' Newton crater. Claims of water on Mars have been made before, but a new discovery of potential liquid water on the Red Planet's surface last week is still making waves in the science world. What differentiates the new find from previous discoveries is the fact that it's the strongest evidence yet for liquid water, as opposed to ice, and it's on the Martian surface, as opposed to miles underground where it would be difficult to verify its presence. 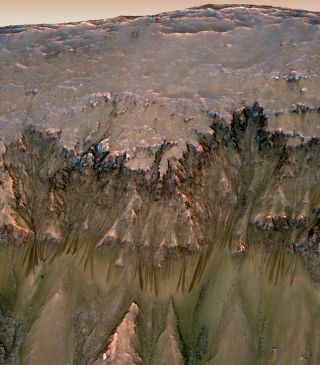 The research is based on observations by NASA's Mars Reconnaissance Orbiter, which observed seasonal changes in slopes carved into the planet's surface that appear most likely to have been formed by flowing salty, briny water. Scientists not involved with the project agree that the discovery could be big. "If the features identified, recurring slope lineae (RSL), can be confirmed to represent briny flows, this would be a very significant finding," said MIT scientist Christopher Carr, who is building an instrument that could detect DNA and RNA on Mars, if they exist. "It wouldn't dramatically change our understanding of present-day Mars as generally cold and dry, but it would be important to the search for life on Mars." Liquid water is a treasure trove for scientists because of the potential it offers for extraterrestrial life. All life on Earth requires liquid H2O to survive, and researchers suspect the same may be true elsewhere. Not only does the new discovery rekindle hopes that Mars hosts life, but it offers the chance that finding it might not be as difficult as once thought. "Before this experiment, you would say looking for life on Mars is going to be tough" because it would involve digging deeply to the hidden caches of liquid water thought to exist deep underground, said Seth Shostak, senior astronomer for the Search for Extraterrestrial Intelligence (SETI) Institute in Mountain View, Calif. "Now maybe it's gotten much easier to do an experiment for life on Mars, which involves just digging a hole a couple feet deep. You might do an experiment that really could pay off." Until now, many searches for life have also focused on the Red Planet's potential for past habitability on the surface, when Mars was thought to be a much wetter world. "Identification of environments where life might be able to survive on present-day Mars could shift our focus from past to present-day habitability," Carr said. "The subsurface might be one good place to look, but areas with potential liquid brines at the surface are much more accessible." Zubrin, who has long been a proponent of sending people to explore Mars, said the find boosts the rationale for such a mission. "That there is water on the surface means that explorers could go to Mars and potentially find extant life on the surface of Mars," Zubrin told SPACE.com. "It underscores the reason why Mars should be the target for human exploration. You're not going to find life on the moon, you're not going to find life on an asteroid. We need to send human explorers to the complex environments where the complex skills of human beings are actually useful." But before we start counting our Martians before they hatch, all the scientists advised caution until more data is available to prove that the slopes are actually caused by water. "It's very exciting, but it's too early to know for sure without more data," Carr said. He and Shostak both pointed out that spectral imaging, which looks for the unique chemical signature of water in the images, has not been able to verify the presence of the compound on Mars. "The expected signature of water has not been detected in the RSLs — this may be a problem of resolution and sensitivity, but could also be due to a lack of water in RSLs," Carr wrote in an email. "There are potential other explanations that don't involve brines, like movement of dry particles (mass-wasting). So, it's very exciting, but it's too early to know for sure without more data. In the end, the data will win no matter what we want to believe."